Drumlina Attwood Megan took home the Diageo Baileys Champion Cow Competition today at the 35 year of the Virginia Show, Co Cavan. The syndicate-owned winner from Mulladuff, Glaslough, Co. Monaghan was also Reserve Champion in the Bailey Champion Cow competition last year. Producing 10,261kgs of milk and 774kgs of milk solids in her last lactation, proved a worthy winner of the ‘super-milkers’ competition, the Judge said. Judge David Hudgson said he was looking for a well-balanced cow, with excellent legs and feet and above all an excellent mammary system. He said he was also looking for shorter cows, with a bit more style about them, a cow that would catch your eye coming into the ring. Entry is exclusive to cows that produce more than 7,000kg of milk a year also producing 500kg of milk solids. The competition has become well known within dairy breeding circles as the ‘highlight of a show-man’s year’. Breeding a Diageo Baileys Champion is what every top Holstein Friesian breeder on this island aspires to achieve. The 5-way syndicate took home a trophy and €2,000 cash prize. Reserve Champion was Milliedale Dusk Rhapsody from Donal and Kathleen Neville’s farm in Ballinaguilt, Croagh Co. Limerick, a fifth lactation cow producing 10,275kgs of milk last year. Seamus and Aidan Foody’s cow was awarded the highest protein producer. The title was claimed by Sprucegrove Lavanguard Peggy, producing 1,252kgs of milk solids at 3.26pc protein. 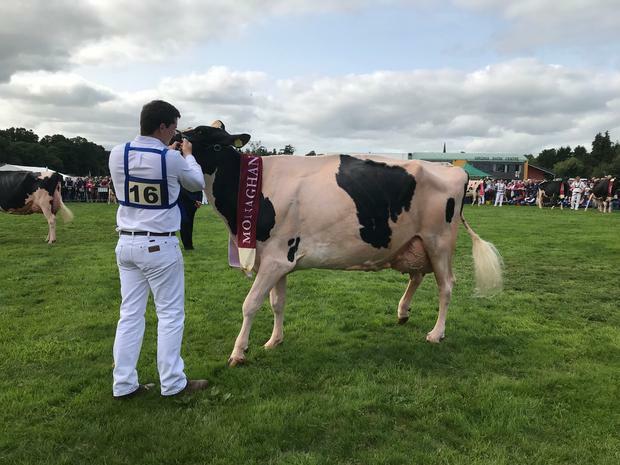 The Junior Cow Champion will be going home to Wexford this year with Hella Attwood Grace, owned by Philip and Linda Jones from Killowen, Gorey. For Diageo/Baileys, the association with top Irish dairy breeders helps underpin the quality of the product’s primary raw ingredient (Irish dairy cream). Diageo Ireland exports €1billion worth of produce from Ireland to 150 countries and is one of the country’s best-performing food & drink exporters.